Black Western Style Alligator Print Leather Belt With Crystal Rhinestone Buckle and Crystal Rhinestone. 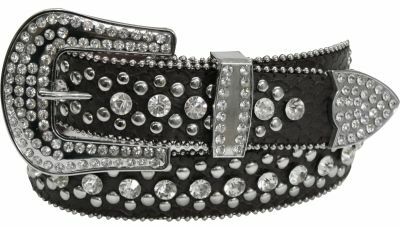 This Western style belt features black alligator print leather accented with silver studs and crystal rhinestones. Fleur De Lis conchos is adorned with crystal rhinestones. Large buckle is accented with crystal rhinestones. Edges of belt features silver beading. Small/ Medium (SM) 31" to 36"
Medium/Large (ML) 35" to 40"
Large/XLarge (XL) 38" to 42"
Black Western Style Alligator Print Leather Belt With Silver Buckle. 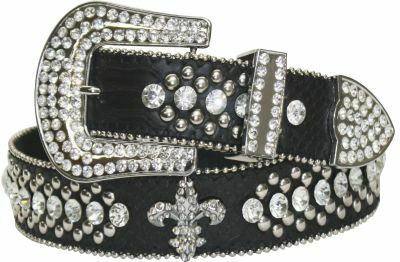 This Western style belt features black alligator print leather accented with silver studs and crystal rhinestones. Large buckle is accented with crystal rhinestones. Edges of belt features silver beading. Black Western Style Alligator Print Leather Belt With Crystal Rhinestone Buckle and Crystal Rhinestone Horseshoe. 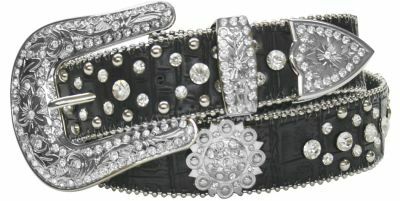 This Western style belt features black alligator print leather accented with silver studs and crystal rhinestones. Horseshoe conchos is adorned with crystal rhinestones. Large buckle is accented with crystal rhinestones. Edges of belt features silver beading. Black Western Style Alligator Print Leather Belt With Engraved Silver Buckle and Crystal Rhinestone Cross Conchos. 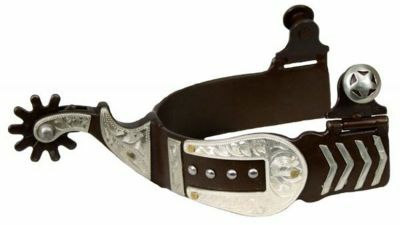 This Western style belt features black alligator print leather accented with silver studs and crystal rhinestones. Silver cross conchos is adorned with crystal rhinestones. Large buckle is accented with crystal rhinestones. Edges of belt features silver beading. Black Western Style Alligator Print Leather Belt With Engraved Silver Buckle and Crystal Rhinestone Conchos. This Western style belt features black alligator print leather accented with silver studs and crystal rhinestones. 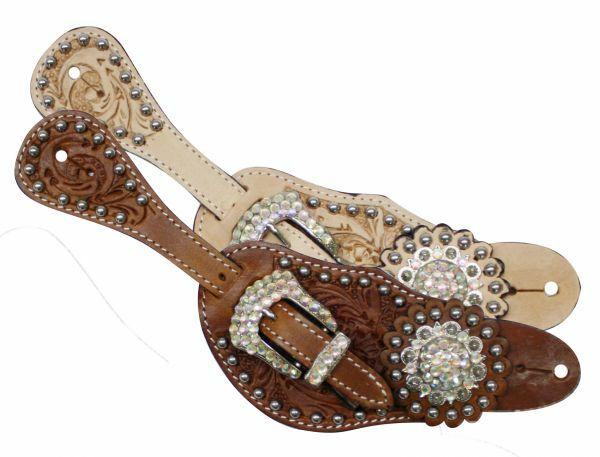 Silver flower conchos is adorned with crystal rhinestones. Large buckle is engraved silver accented with crystal rhinestones. Edges of belt features silver beading. Men’s size acorn tooled leather spur straps with silver engraved pleasure horse conchos. 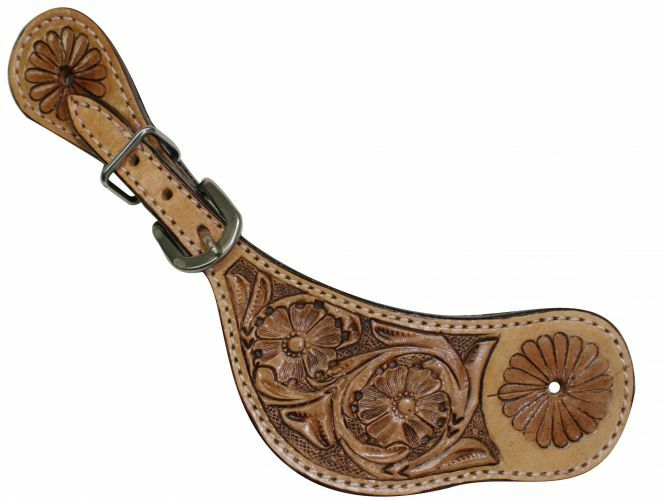 Ladies Show Spur Straps with Engraved Silver and Basket Weave Tooling. 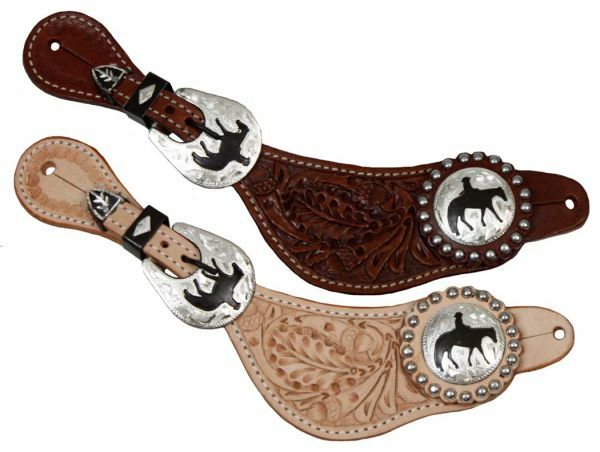 These spur straps feature silver studded leather with basket weave tooling and engraved silver hardware and conchos. Will Adjust 7.5" to 10". 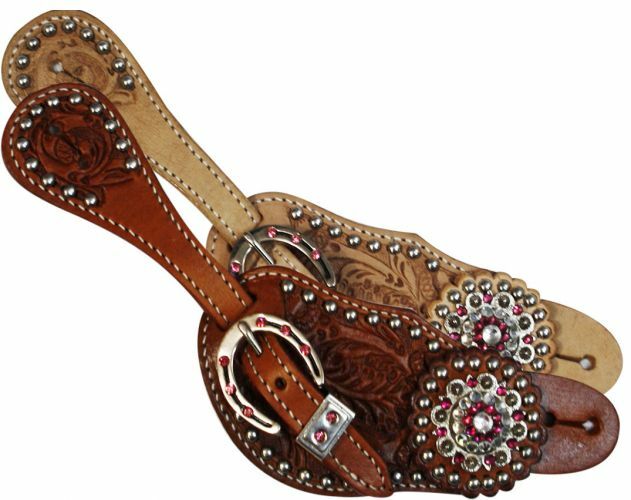 These spur straps feature silver horse shoe buckle accented with pink crystal rhinestones and are accented with color and clear crystal rhinestone conchos. Ladies Tooled Leather Spur Straps with Crystal Rhinestone Hardware and conchos. These spur straps feature oak leaf tooling accented with silver studs. 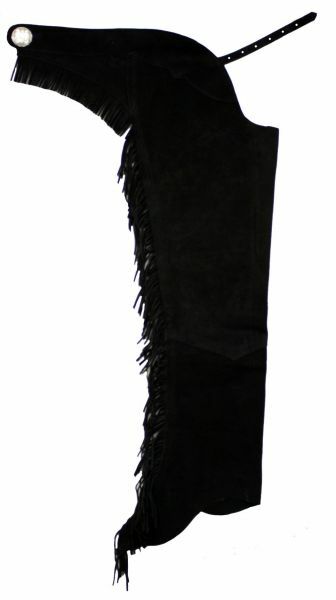 Buckle and hardware are adorned with crystal rhinestones. 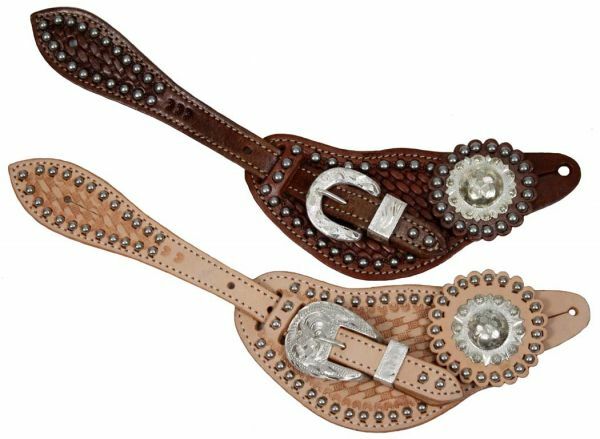 Spur straps feature silver conchos accented with crystal rhinestones. Floral tooled beaded spur straps with silver quarter concho. Pink tooled flowers and green accents. Heavy stitched edges and is accented with a clear crystal rhinestone in center flower. Ladies Size Leather Spur Straps with Filigree Print. 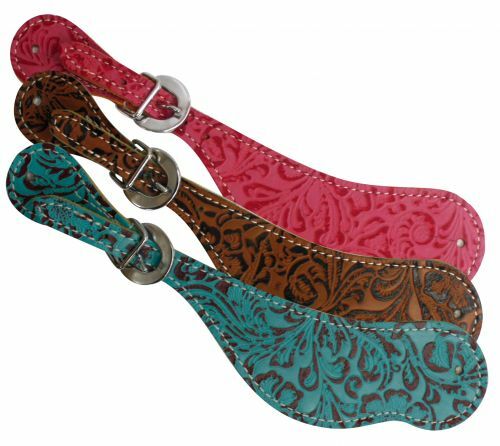 These straps feature teal leather with brown filigree accented with copper colored studs. Large copper colored engraved buckle. Adjusts 7.5" to 9". 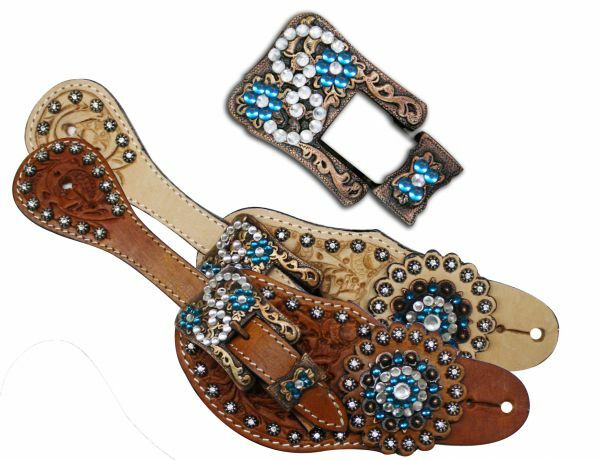 Ladies Tooled Leather Spur Straps with Vintage Style Buckle and Crystal Rhinestone Conchos. 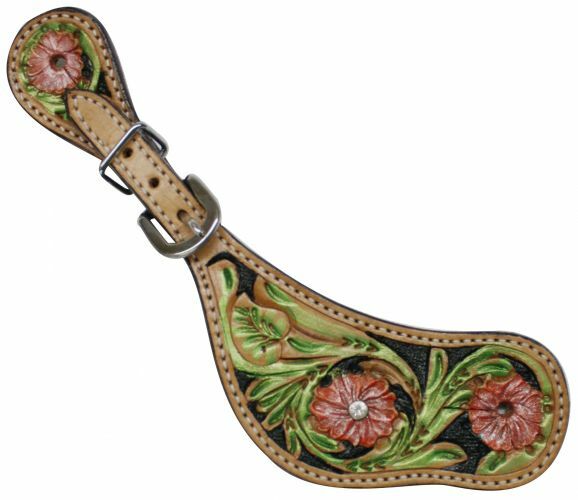 These spur straps feature floral tooled leather accented with silver flower studs. Copper colored vintage style engraved buckle is accented with crystal rhinestone design with blue rhinestone flowers. Copper colored conchos are adorned with colored and clear crystal rhinestones. 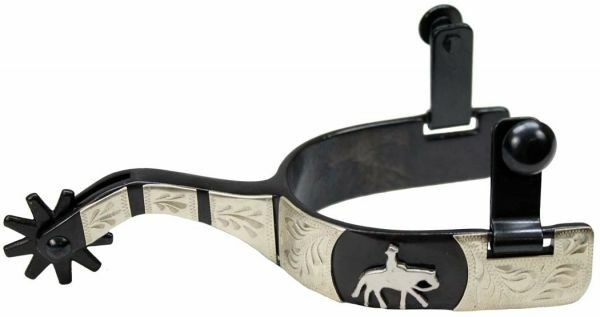 Men’s size black steel silver show spur with pleasure horse. Spur details: 1" band, 3" shank and 3" boot opening. 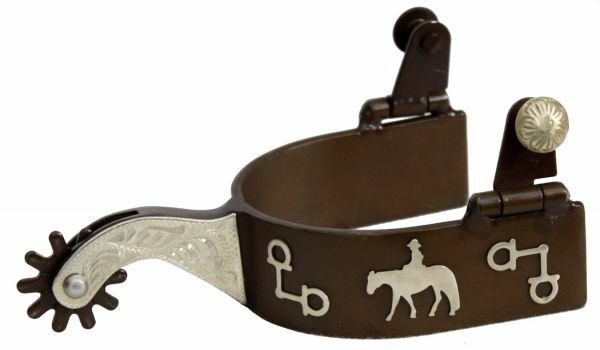 Antique brown spur with bit and pleasure horse overlay. Spur features 1 1/4" band, 3 1/4" boot opening, and 2 1/2" engraved silver shank including 10 point rowel. Stainless Steel Horse and Rider Embossed Spur with Engraved Silver Overlay. Stainless Steel Spur With Rope and Filigree Engraving. Brown steel spur with 1.25" band and 3.5" shank. Details are silver engraved scrolling on band and shank. Brown steel spur with 1" band and 2.5" shank. 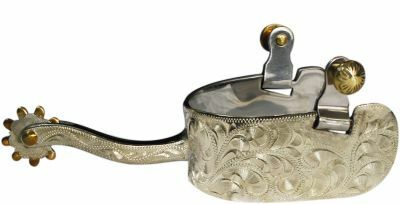 Details are engraved silver scrolling and rhinestones. 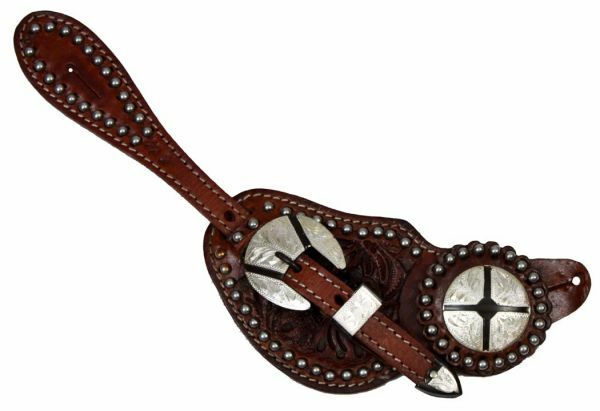 Antique brown silver belt buckle design spur with silver overlay. Spur details: 1" band, 2 1/2" shank including 10 point show rowel and 3" boot opening. 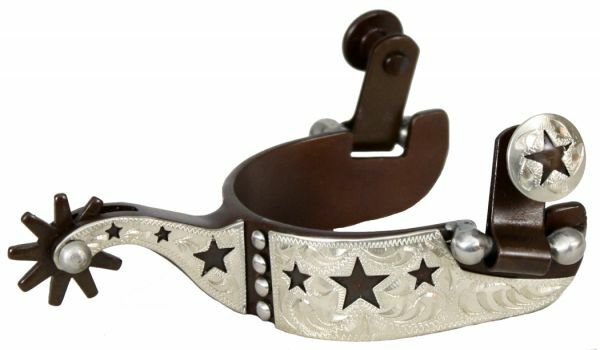 Youth size antique brown steel silver show spur with cut out star and dot overlay. Spur details: 7/8" band, 2" shank including rowel and 2 1/2" boot opening. 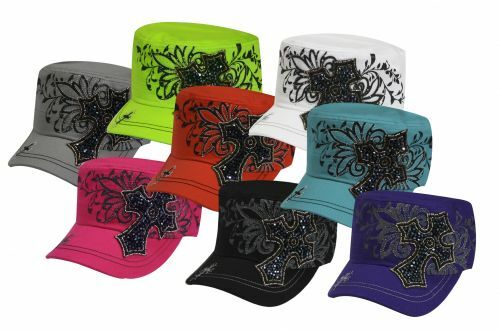 Ladies Military Cargo Style Hat With Western Beaded Cross and Filigree Design. Adjustable One size fits most. Ladies Military Cargo Style Hat With American Cowgirl Embroidery Accented with Crystal Rhinestones. 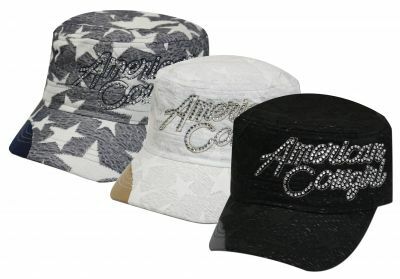 This hat features loose embroidery stitching with stars. American Cowgirl Stitched and accented with crystal rhinestones. Military Cadet Style Hat with Rhinestone Horse Design. 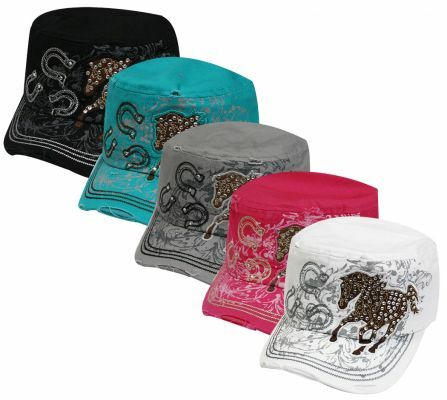 This hat features filigree print design and is accented with three embroidered horse shoe outlines and a large brown horse with embroider stitch outline and distressed bill.